Color. When it comes to landscape photography, color has the power to both take a good image to great, or take that same image, and absolutely ruin it. Sometimes it is a very thin line to balance on, but absolute ruin can be avoided with a little knowledge of color theory. Color theory is a technique used primarily in the varying fields of the world of art and design, and plays a major role for creating effective color palettes for those particular fields. Color theory is an important component of delivering a message, or otherwise, just making a combination of colors look great together, simply put. Color theory is not something that is typically referred to when it comes to landscape photography, but it can have extremely useful application. If we consider color theory while in the act of creating landscape photographs, we can find guidance for how to approach and manage color for better looking images. The core of color theory is the act of arranging color into harmonies, of which there are several types. These are most commonly known as analogous, monochromatic, complementary, split complementary, triadic, and quadratic. I have found analagous, complementary, split complementary and monochromatic to be the most useful when it comes to landscape photography as they tend to be more flexible and versatile than triadic or quadratic. 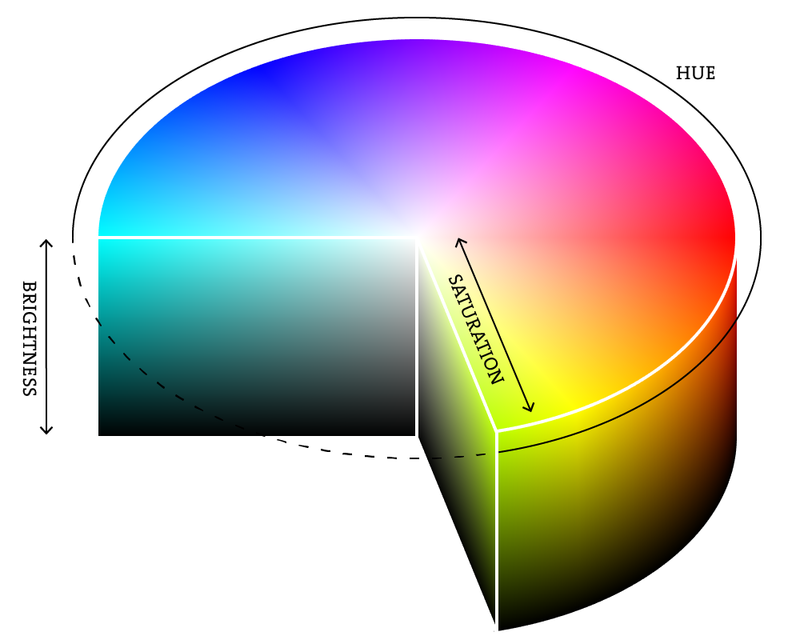 Below is an explanation and example of each of these color harmonies. Analagous - An analogous color harmony are a group of colors that lie directly adjacent to each other on the color wheel. This group of colors can have a limited spread of just 2 colors, or can spread further, along as much as half of the entire color wheel, although at this point or further, it will start to lose its identity as an analogous harmony. A good example of an analagous color range spanning from teal to vibrant blue greens, to a greenish yellow. 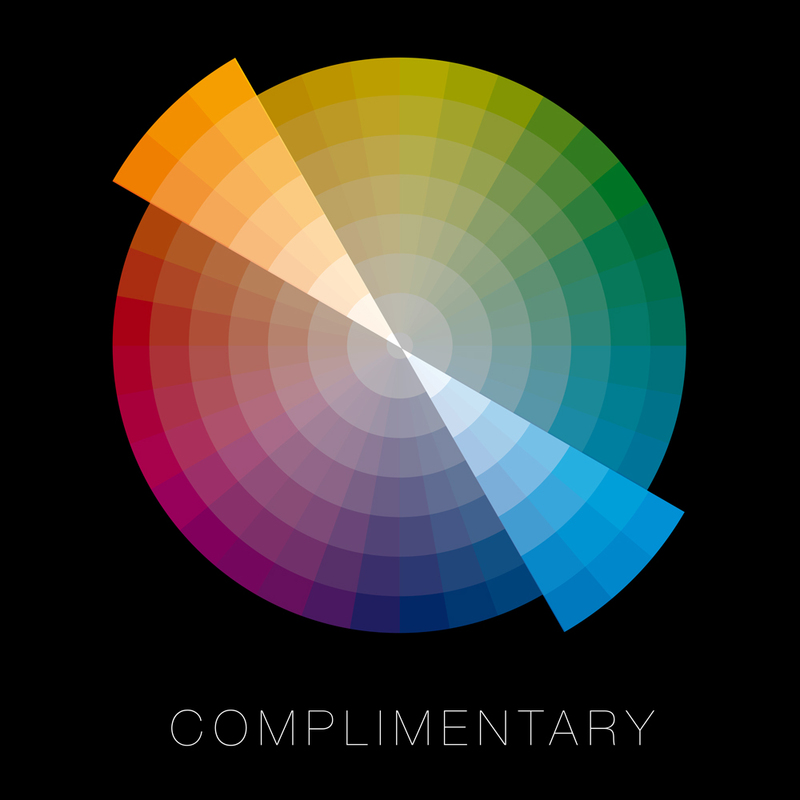 Complementary - This color harmony is comprised of two colors that lie directly across from each other on the color wheel. The spread of color on either side can be increased to a degree to include more color on either end. A common complementary color scheme found in nature is that of a warm cool combination. Cool blue-ish tones mixed with warm orangey tones. Here is a simple complementary color harmony of yellowish orange and blue. Split complementary - By taking two colors that lie directly adjacent to one of the colors in a complementary color harmony, you get a split complementary harmony. A more difficult harmony to utilize, but can be useful in certain situations. The magenta in this image is harmonizing with a split of orange and green in a split complementary harmony. Monochromatic - This is comprised of one color, with varying values, meaning varying degrees of brightness, or varying degrees of saturation. Most typically this color harmony is what a black and white image would be. A monochrome image consisting of varying shades of a desaturated blue. Triadic - Combining any three colors equally spaced from each other on the color wheel. This harmony is very similar to a split complementary and in the context of a landscape photograph, where a 'single' color in an image can often span over a slight range of that color, sometimes the color harmony identity in the image can be blurry. In this image from Kauai, the greens of the Naupaka, the red/orange of the cliff and clouds and the blue of the sky approximately make up a triad color harmony. Quadratic - Combining four colors that have a rectangular spatial relationship on the color wheel. This is often also referred to as a double complementary because it is the combination of two complementary color harmonies. This image combines two complementary color harmonies. the blue of the sky compliments the orange of the foliage while the green of the brush compliments the pinkish reds of the clouds. Diad - Combining two colors that are seperated by two hues of color along the color wheel constitutes a diadic color harmony. This harmony has some flexibility since it is difficult to quantify what exactly makes up a single hue of color'. In this image a diadic harmony is made of up a slightly reddish-orange hue and a slightly magenta-blue hue. Something to note with the combination of only two colors is that there are many combinations of two colors that work well together, and they follow no mathematical rules or relationships. For instance, pink and blue is a fantastic color combination, but they are not complementary to each other, nor do they lie particularly close to each other on color wheel. If your scene only consists of two colors, there are not really any guidelines to help determine if they work well together. The best tool in this case is just your own eye. At this point it should be stated that strict adherence to color harmonies in landscape photography is not entirely necessary. Finding perfect color harmonies in nature is rarely easy, or even possible. Nature is chaotic, and the color we find in it is presented to us, we don’t create it. In rare instances we may find perfectly balanced combinations of color in nature that fit within the color harmonies mentioned above. Sometimes we can also take measures to make a color palette more harmonious in field with decisions such as wether to combine our landscape with a colorful sky, or with a simple blue sky with white clouds, or wether or not to include colorful objects such as flowers, etc.. I personally generally do not let color influence what I photograph in nature as I know that in processing I have a certain level of control for highlighting the colors that do work well together, and managing the other colors in a way that make them less of a focus. Again, strict adherence to color harmonies with landscape scenes is not entirely necessary, but it certainly helps to understand color theory and use it avoid blatant distractions to color palettes, or to make modifications to colors in order to get the color palette of an image to be more harmonious. When making modifications to colors with processing, it's important to keep in mind the 'context of nature', or in other words, keeping a color within the realm of believability. This will be discussed in more detail later. This is important to note with colors in landscape images, especially in post processing, where you have control of how a color can be presented. Colors with full brightness and varying levels of saturation will feel light, airy, and colorful, whereas colors with decreasing saturation and brightness will feel dark, and eventually more ‘dingy’ or ‘muddy’ as they become less saturated. You can see how this is the case in the lower left of the orange in the photoshop color picker. Each color has a place, and being able to decipher when a certain color should be bright and light, or dark and dingy is a difficult skill to acquire. Less experienced color users tend to think that making every color their brightest and most saturated is the best choice. When this happens, the image becomes loud, noisy, usually not harmonious due to too many colors, and many viewers will label the image as over-processed. I've found a more tasteful approach that gives a dramatic result is targeting brightness and saturation to very specific areas of color generally around highlights in the scene. Generally anything receiving direct light is obviously brighter, and can also handle more saturation. Vibrant colored water, colorful flora, lit up clouds, the golden colors around the sun are all good examples of objects in landscape scenes that receive brightness and saturation well. If you were to sample most of the colors in my images, you would find that generally, the colors are not very saturated. The saturation is applied in a very calculated way to specific colors that serve the composition and the color harmony, which ultimately gives the illusion of a very colorful and vibrant image. A technique I use often in regards to saturation is not punching the saturation overall of the entire object, but rather making targeted increases in saturation to specific areas of an object, usually in correspondence to light direction. For instance with the image to the right, of some clouds around Fitz Roy receiving direct sunrise light, rather than hitting the entire area of clouds and mountain receiving the light with a ton of brightness and saturation, it is instead done sparingly, and more targeted to different areas of the object. As a result this creates the illusion of everything being very saturated, but not overdone, and it also increases the depth and dimension of the objects. 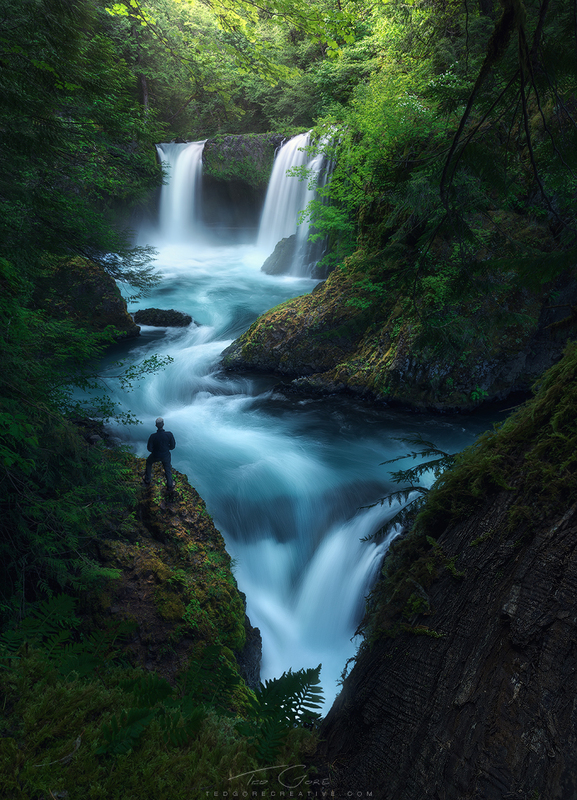 Another example is in the second image to the right of Elowah Falls. Notice that the greens generally are darker and less saturated except in certain spots corresponding to the presence of light as opposed to just blasting all of the green foliage with brightness and saturation. Again this creates more depth and dimension, and is also used in shaping the light in the scene overall. When making alterations to brightness and saturation with colors always keep an eye on the RGB histogram to ensure that you don't blow out a color channel. I do sometimes allow small amounts of a certain color to blow out for the effect, but letting a large area of color blow out is not a good idea. When working with color harmonies and brightness and saturation of the colors in your scene, you want to pay attention to the dominant colors. These will be the main colors that comprise the harmony, and usually the colors of the primary subjects of the image. It works well to focus your efforts of increasing saturation and brightness to these objects/colors as that is where you want the attention of your viewer to go. As an example, the image to the left of the Kofa mountains, cholla cactus, and yellow flowers is utilizing an analogous color harmony from yellows to reddish orange colors. The scene also has green of the brush and small bits of blue sky in it, but these colors, which are not part of the analogous harmony, are intentionally left darker and less saturated. The real saturation and brightness is carefully applied to areas that are receiving more light and is utilized again to create more depth and dimension on those particular objects. Yellow. This color is usually very vibrant in nature usually existing in the form of light, like in the brighter parts of the sky around the sun, or where direct light is hitting objects, and then also in certain types of flora. Yellow is usually a great color to hit with some brightness and saturation wherever it appears. I usually prefer to shift the color yellow in skies slightly more towards orange. Orange. Similarly to yellow, appearing often in skies and in flora, it is also generally associated to objects in a scene that are very bright and thus can take more brightness and saturation. I usually try to avoid allowing colors in the orange range from becoming too dark and desaturated as it turns brown. This is especially important for skies, and I avoid it at all costs. It is just not a pleasing color to see in a sky. Red. This color tends to appear as the most saturated on camera sensors and thus is very easy to blow out. Be careful of this. When red is present in skies, I pay extra attention in only applying saturation very selectively as described in the techniques above. Red in flora looks great when given an extra punch of saturation. Red also looks nice when it's darker, as you are out of the muddy brown color area. Magenta. This color is powerful, and is a good color to use to create the illusion of a more colorful image overall. I see this overdone quite often, and I personally choose to use it in very subdued, darker, less saturated tones. It's a great way to get a blue sky to look a little more harmonious with warm/red clouds and light, and it is also a great color to use for night and twilight scenes. Just keep it more subdued. No Barney-purple skies. Repeat after me. No Barney-purple skies! Blue. A tricky color that can be very difficult to reign in, especially in primarily blue skies. Pay extra attention to not allow variations of blue in blue skies, in other words, allowing the combination of teal-blues, blue-blues, and magenta-blues, unless on the magenta side, some colorful light otherwise exists and motivates the presence of magenta in the blues of the sky. I put extra care into making blue very consistent in blue skies that do not have edge of day color. Handle blue in water very carefully. It can look great when it's brightened and saturated, but I find it needs to be present in the first place to handle bringing it out further. Adding blue to water that is otherwise colorless can work well, but in very subdued levels. Teal/Turqoise. A color that does not show up much in nature generally except in glacial/snow melt waters, or in seawater in certain parts of the world. In these scenarios it's a fantastically beautiful color and I always love to feature it in images when ever I come across it. I take extra care to not allow this color to show up in open sky as it is too much of a departure from the context of nature(discussed later). Green. A color that is abundantly present in nature. I find greens usually look the best in analogous color harmonies such as in forest scenes or waterfall scenes where the greens can be mixed in with yellows, teals and blues. I tend to prefer a very slightly blue-ish green in forest scenes, and find that adding just a touch of blue to them can make them look really nice, as opposed to going with more of a yellow green. Yellow-ish greens tend to look a little more drab and sickly. Instead limit yellow greens to the highlights of green flora. Something I also take special care in avoiding is green in skies. This can happen in skies where the warmth of the color of the sun transitions to the blue in open sky. This can be avoided by shifting the warm colors more towards orange and the blues of the open sky slightly towards magenta. Once an image is captured, we do have decisions that can be made in post processing to modify colors for better balance and adherence to color harmonies. When approaching the processing of colors of a landscape scene, something that is important to keep in mind is a term I call the ‘Context of Nature’. The context of nature tells us two things. First is that the colors in nature are presented to us as reality, and because of the nature of their existence, are harmonious in their own right. A grouping of colors found in nature is beautiful, regardless of its level of adherence to any particular color harmony and quite often color palettes inspired by nature are often used in the design world. Second is that any alteration to a color in nature done in post processing will eventually begin to remove the reality from the scene. And while in the scope of ‘Art’, any of this is acceptable, the unspoken ‘rules’ of landscape photography would result in an image losing its identity as a ‘landscape’ photograph at an unspecified tipping point, which is largely determined by the viewers own personal tolerance for what is acceptable to them. We have to keep this in mind when working with colors in post processing to create more harmonious color combinations, and determine when an alteration has gone too far. Of course this is largely dependent on an individual's own personal taste. Again, in the scope of art, do what you want, but in regards to landscape photography, and the context of nature, this sort of thing can have a negative impact, and you might find viewers of your images saying things like, 'this looks a little ridiculous'. Finding a balance with making alterations to colors while maintaining the context of nature is a highly refined skill that takes time to develop. A good example of this is shifting the blue of a sky slightly towards magenta. A certain subtle amount of this is generally accepted by viewers, but making a sky all out purple(barney-purple), strays too far from the context of nature, and a viewer may find themselves distracted when looking at the image, wondering why the sky is purple when they have mostly known skies to be blue. An example of this is the image here to the right from Cinque Torre in the Italian Dolomites(click to enlarge). The reality is that the color of the sky was blue. What I was finding in processing that the the blue was not fitting into a color harmony very well, and was hurting the image. By comparing the colors to the color harmonies I figured out that a split complementary color harmony(refer to the first section on color harmonies) of orange, magenta and green would work nicely, and all I needed to do was just slightly shift the blue of the sky towards magenta. The presence of magenta flowers strengthened this. In the context of nature, taking this too far would start to look goofy, but I remedied that by not going to far with the hue shift, and keeping the magenta slightly desaturated. Color is powerful. It can make an image shine and wow a viewer. It can also ruin an image if not handled correctly. Developing a good eye for color takes time and practice. I hope that the information I've shared in this article gives you some helpful insight into how I approach color. It is a complicated topic, with even more to discuss than what I've covered in this article, and I plan on diving even deeper into the subject in future posts. If you have any questions please don't hesitate to ask, I only request that you ask the questions in the comments section below so that future readers may also see the questions and the answers that I will do my best to diligently provide! Also, if you haven't listened to it yet, I recently was a guest host on the Tripod Podcast by Improve Photography, where we spend some discussing color theory. If you'd like to give it a listen, check it out here! This past summer I went exploring with my great friend and photography colleague Erin Babnik. One afternoon we had quite a trying and harrowing experience. Here is the story. I'll follow that up with some thoughts on wilderness medicine as I recently became a certified Wilderness First Responder, which was very much influenced by this experience. If you've read the story before, you can skip down to the bottom. The image above is of Tre Cime, and you could perhaps call it the sweetheart of the Italian Dolomites, loved by the Germans and Italians, and frequently visited by them in droves. It needs no introduction. Erin Babnik and I spent a couple days here during our recent travels in the area. At this point on our trip the weather had begun to fall into a pattern that was far less than ideal that consisted of clear mornings and stormy afternoons, usually with clouds forming so thick that by the end of the time when the shooting would be good, there was no light to be seen; but by morning, they were gone again! It was wearing us down as it made it difficult to get the really great light we of course wanted. However, we mustered up some hope on this particular afternoon as the storms rolling through seemed charismatic, especially when the lightning started striking off in the distance as we hiked out in pursuit of our yet-to-be-found compositions. When we first got to this spot, I had not even placed my gear down, or even turned around to look at the view when I saw a flash in my peripheral vision and an almost instantaneous BOOM crackled through the air. Erin and I jumped and spun on our heels in the direction of the flash, and only moments after we began to hear the unmistakable sound of falling rock echoing from within the chambers and canyons between the massive peaks of Tre Cime and across the valley. It was immediately evident that lightning had just struck one of the peaks of Tre Cime directly, exploding rock apart, which now crumbled down somewhere in between the monoliths. We stopped, stared, and verbally expressed our awe as the crumbling resumed for a length of time, slowly fading as the last few smaller rocks found their way down to their final resting places. We tried to see the rockfall, but there were no visual signs of it. When the shock of the experience wore off, we knew that we needed to get to work. We had an opportunity to get shots of lightning around Tre Cime, maybe possibly even striking the rock formation again. How amazing that would be! We were bummed that we hadn’t left 10 minutes earlier… maybe we could have captured that strike! We loaded up our fastest and largest memory cards, set our cameras to burst mode, and began firing away. It was not dark enough to do long exposures, and neither of us own a lightning trigger, so the spray-and-pray method was all we had. Our buffers filled, and the cameras began to lag. It seemed like every time we stopped firing to let the buffers catch up—sure enough—the lightning would strike! It was frustrating to say the least. The clouds rolled over the peaks, and strikes continued, seemingly getting further and further away, as we continued to miss them while our cameras caught their breath. I ended up catching a few strikes, this particular one being the best. I was excited to have caught it, but that’s not the end of the story! Satisfied with what I had captured, I relaxed, stepped back from the camera to let myself take in what it was I actually seeing. It’s easy to forget the moment that you are experiencing when you get lost in the camera and the pursuit of the image. Soon after I began to focus on my surroundings, and the beauty I was so lucky to experience, I heard something. A distant cry racing through the air across the valley. It was vivid and clear, bouncing of the huge walls of rock like a megaphone. A few moments passed and it hit us again, only this time we understood. To be quite honest, our world is so full of noise, and crying wolf, initially hearing this had no effect on me. The scenarios ran through my head, ‘oh, someone’s down there screwing around.’ And I didn’t think much more of it. We began scanning the trails below, looking for people and who the yelling was coming from. It was then that we noticed two people hobbling around the corner just north of the saddle. Ok, they had my attention. Erin’s too. That audio cue zeroed our vision in to the source. The two people were close to each other, but too far away for us to understand what was going on with them. Erin began to yell down to them, and while I can’t remember exactly what she said, it had something to do with asking what the problem was. She chose to go to their aid, and I decided to stay up with our gear. “Grab my first aid kit and bring it to me if I yell up for it!” She shouted as she trotted down the trail. I watched her descend, quickly reaching them as they crested the saddle. They huddled together for a few moments, but they were still too far for me to be able to tell what was going on. Shortly after, Erin yelled up to me for the first aid kit, which I quickly found, along with my trekking poles and a surge of adrenaline to rush to the aid of a person in need. If you follow my work, you may recall my story on a previous image about how I had flared up a chronic knee issue when I first began my trip. Luckily, as I raced down the trail, that injury, which I had slowly been recovering from, was now not an issue. Just in time! When I reached them, they had already begun their descent down the trail to the nearby refuge hut. (You can see the trail to the hut in the image going down the bank on the left side of the peaks.) As I closed in, it became clear what was going on. They were two climbers, a man and a woman, and the woman was slowly limping her way down the trail, flanked by her male companion on her left and Erin on her right. Blood covered the woman’s right leg, and as I caught glimpses of her right arm from behind, I could see that her hand was completely red, and a couple of her fingers were now only vaguely recognizable as…fingers. The man acknowledged me reaching them, and began to fill me in on what happened as Erin gently held onto the woman and gave her verbal cues about where to step, trying to find the path of least resistance. The lightning strike we had witnessed, and the resulting rockfall, had a victim. Them. They were climbing when it happened and were on their second belay when the lightning struck and went right through them. Worse still, they were in the path of the rockfall, with the woman bearing the brunt of the onslaught. Smaller remnants of the rocks were stuck in the man’s chalk bag and his climbing helmet was smashed as proof, if the tattered appendages of the woman weren’t already proof enough. He seemed to be fine, and braced her, trying to help her take the weight off of one leg which she seemed not able to bend, as they made their way down the trail towards the hut. We eventually reached the hut, and since we had sent a passing hiker ahead to it to alert the staff, they rushed out to help, trained to be able to properly manage these situations. As the two climbers were rushed inside through the dining room and into a distant room, Erin and I stopped and watched them disappear around that corner. We glanced around at some of the other people who had ultimately walked down the trail with us, exchanged various terms of amazement and shock, and eventually left the hut to return to our gear, which was still sitting up on the mountain where we had been shooting. When we reached our gear and began packing up, the distant drumming of an E-vac chopper grew louder. It landed, people walked out to it, holding a stretcher…obviously the injured woman, and then it flew away. It seemed like she would be totally fine, and we later learned from a staff member of the hut where we were staying that she had a broken arm and leg. It makes me all the more amazed that the woman made it that far with such substantial injuries! I’m glad that the couple are safe, and (I imagine) are now recovering fully from the disaster. It’s interesting to look at this picture and think that at the moment I shot this, they were most likely back within the peaks, fighting for their lives and trying to get out safely. I’m glad to have this image as a reminder of the experience. A couple weeks ago I returned home after a jam-packed 5 day instruction course that involved 30+ hours of pre-course prep work in order to become a certified Wilderness First Responder. This training gives me the tools to respond to situations exactly like the one you just read. After these events unfolded, Erin and I found ourselves frequently asking if we did the right thing, and if not, what was the right thing? As I worked through the course, I began to piece together the proper protocol for something like this, but it was still a confusing situation. By the time our paths crossed with the couple, they had already gotten themselves that far. There was still a danger of of lightning. Her injuries were unclear. A hut with plenty of help was not far away(maybe a 15 minute walk at a normal pace). So what was the right course of action? Well, it's not exactly black and white, but, it's pretty easy to rule out a lot of potential dangers and anticipated problems. My training as a WFR gave me the skills to properly assess a situation very quickly, and then organize a proper response. The first thing to always do, known as the primary assessment, is to check the three critical systems an individual needs to live. The circulatory system, the respiratory system, and the nervous system. Given the fact that this person had just walked themselves to this point, it was pretty safe to conclude that the circulatory system and respiratory system were functioning. The more pertinent questions to ask at this point, since the person had been showered by falling rock, were was her spine injured, and/or did she suffer a blow to the head strong enough to cause a traumatic brain injury? Being knocked unconscious by a blow to the head is strong evidence that a traumatic brain injury may have occurred. But, I don't recall anyone saying anything about her being knocked unconscious. Also, the trends of a persons mental state can also indicate that something is wrong with the nervous system, and this lady was awake and oriented, not degrading mentally, further suggesting that she had not suffered a TBI. In hindsight, I think it was safe to rule out that it wasn't a concern. The only thing left to check with the three critical systems was her spine. And this is where things get a little grey. She had just walked out of where the couple were climbing. No small task. Could she have done it with a spinal injury? Well, maybe. A spinal injury isn't always debilitating, so the fact that she had just traveled the distance that she did doesn't really allow me to conclude that she was clear of a spinal injury. In hindsight it probably would have been worth while to have her lay down and do a full spinal assessment in the field. But, you also have to consider the scene. Actually a 'scene size up' is the very first thing you do when approaching a patient in the field. Simply put, is everyone on the scene safe from potential further injury? Well, in this case, maybe not. There was a storm passing through with lightning. More grey area. Given that scenario, and the fact that she had just traveled the terrain that she did, I would have skipped the spine assessment and moved on to other matters. At this point, it is safe to conclude that this person is not in any IMMEDIATE life threatening danger, other than the possibility of getting directly struck by lightning. And that went for the now, 6 people standing up on a very exposed saddle, with a lightning storm looming nearby. At this point, I would have moved on to what's known as the 'secondary assessment'. Basically taking a look at the injuries the person has sustained, how urgent of treatment was necessary, and what potential problems may develop. From my inexperienced recollection of the person, she had suffered a substantial wound to her fingers, had bled a lot, and her right arm and leg were very painful, but from what I remember, did not show any disfigurement. With a wound, the first priority is to get it to stop bleeding, which I honestly don't remember if it had or not. I wasn't that interested at the time in looking too closely. It was obvious she had done quite a bit of bleeding, as her arm and parts of her leg were covered in it. The immediate threat with bleeding is volume shock, or a massive loss of bodily fluid(blood or water). It's highly unlikely that bleeding occuring in outter extremities like this will cause volume shock in any short amount of time. Probably not even over a longer period of time if left unchecked. There just isn't enough blood moving through that area for that to occur. This would have been ruled out in the primary assessment as it would ultimately be a problem with the circulatory system. Other than a lot of pain, this wasn't a life threatening issue that needed a high risk evacuation. The other concerns were her limbs, which she was saying were extremely painful. Fractures? Maybe, hard to tell. As stated earlier, they didn't seem to be disfigured, and obvious sign of a fracture. Ideally when a fracture is suspected, you would want to check the circulation, movement, and sensation of the appendages beyond that fracture. So in this case her fingers(which at this point were badly mangled) and hand, and her toes/foot. Checking this would indicate if circulation and/or the nerve bundle supplying the appendage had been compromised. This can result in long term damage and has to be addressed immediately. It would have been relatively easy to check her foot and toes, but her hand, not so much considering her substantial injury to the fingers. Even still, is doing all of that worth leaving the person at risk of environmental dangers? And if we did do it, and determined that CSM was impaired, is it worth a 'high risk' evacuation of having a chopper come and land on a narrow saddle? My hindsight assessment is NO. Especially considering that a hut with a landing zone was a mere half our down the trail. Something WFR's learn is being able to properly determine risk involved with evacuation. There is a saying, don't plan a high risk evacuation for a low risk problem. That would have definitely been the case in this specific scenario. Further more, the persons wishes need to be respected. The couple did not want a helicopter evacuation because they were worried about the cost. As a WFR I can't force anyone to do anything, and they didn't want that, so... end of story! Off to the hut you go. It's funny however, because sure enough, the couple was evacuated from the hut via helicopter. But that may be more a result of Europes chopper-happy nature rather then the immediate medical needs of that particular patient. So there's that. It was very interesting for me to think back on this incident in hindsight with the training I now have. There is always grey area in these situations, but in the end, I'm just happy they got out of there and will be ok. I can't think of any situation where her injuries would have caused any major problems down the line. It's possible should could have suffered permanent damage to her hand, but, considering what happened... she's lucky. Hope you enjoyed the read! If you have experience with wilderness medicine, I'd love to hear your thoughts on the situation! I performed copious amounts of research, pouring over topo maps and google earth in order to familiarize myself as much as I could before my trip to Patagonia last April. My hope was to find my own way, and during the process hopefully find some interesting and unique vantage points. This was not one of them, but I had to visit this spot. 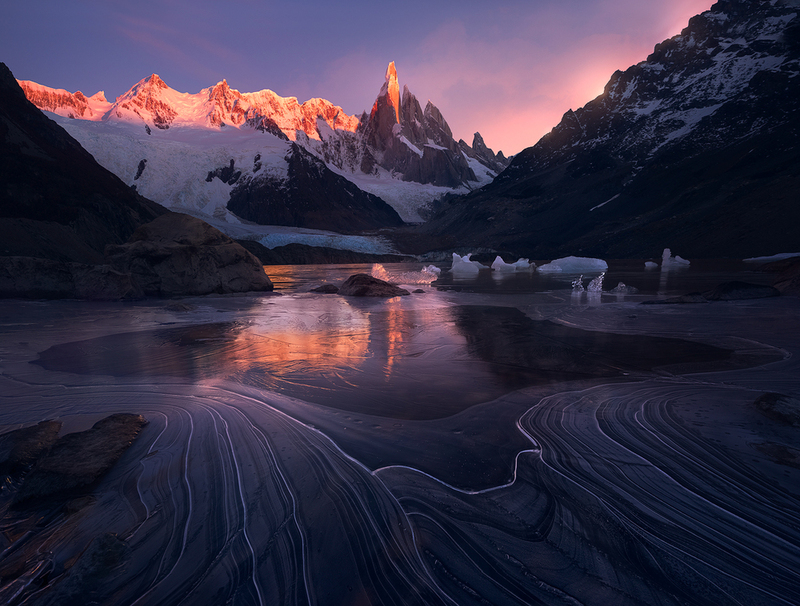 I just had to see it because I had previously been enamored by the ground-breaking work that Marc Adamus did in Patagonia a couple years ago, and I have always loved his image from this vantage point. So I will not take any credit for this area or composition, because that belongs to him, as far as I know. Regardless, I couldn’t pass up the opportunity that I happened upon on this first morning of mine in the wilderness of Los Glaciares National Park. The wall of lenga trees stood before me like a fortress, my headlamp not strong enough to pierce through and show me what possibility I had of reaching the other side. My initial attempt of getting through was a failure and now I sat on a large rock sulking in surrender. Darkness was all around me, sunrise was fast approaching, and I had lost my motivation after the 2 mile slog up the river bed and the battle with other lenga trees I had just finished an exhausting battle with. Whatever. What I could see of the sky through the early morning darkness showed little hope for anything interesting happening anyway. I’ll just sit here and wait till there is enough light so i can make my way around the grove of trees that was ruining my first morning in the wilderness. I’d get to see the lake with mountains towering above, at least… that was enough for me. At least I was trying to convince myself it was. 5 minutes came and went as I sat in silence before a mix of boredom, stubbornness, and determination had me back up on my feet again, stomping up towards that damn grove and diving back in. Surprisingly, it was not as substantial as I had thought, and with a little sweat, I had pushed through to the other side into a much welcomed clearing. This was the spot I had wanted. A clear view down to the lake, and a crowd of dwarf trees spread out before me. Pack off, Camera out, and the scouting for a composition began. With dawn almost on top of me, it didn’t take long before I noticed something while my back was turned to the mountain. Everything seemed have a bit of a pink glow to it. I spun around and my gaze fell on Fitz Roy and it’s siblings being lit up in the most spectacularly selective beam of sunrise light I could have ever asked for. I set to work fast and began firing the trigger when I heard something. It was a crackling rumble that began echoing through bowl, sounding exactly like what I had heard the night prior, which at that time I had passed off as distant thunder. Except this was no thunder. This was a huge chunk of ice breaking off of the glacier below Fitz Roy and tumbling down the mountain, breaking apart and being pulverized into a fine powder. Well, a ‘fine’ powder as far as I could tell. I imagine if I were standing under it, I’d be singing a different tune. Anyhow, this flow of ice eventually found it’s way down into Lago Sucia forming an impressive ‘waterfall’ of ice. Perhaps not obvious at first, so look close! I was able to capture it just at the same time the light was at it’s best. It made for quite a morning, quite a shot, and quite the beginning to my month long excursion to this dream land. Sometimes the images I capture become more about the experience I had with taking them. During my trip to the Patgonia region last april, I spent a few days in the Cerro Torre region in hopes of interesting conditions, and while doing so, I happened to have one of the more frightening wildlife experiences I’ve ever had, and in hind sight, one of the most hilarious. All was well and good in my cozy little campsite tucked away at the end of the Laguna Torre campground that night, until shortly after sliding into my sleeping bag for the night I heard an odd animal noise. It sounded distant, seemingly at the other end of the campground, and at first I thought it was perhaps someones dog… just, a dog that was never properly instructed on how to bark. It sounded strange. A swell of a growl mixed with a squawk mixed with a bark, almost dinosaur like, and/or bird like. Like if you were to try and impersonate a dinosaur sound by sucking in through your vocal chord rather than out, starting at a lower tone and rising to higher pitched over the course of a second. It reverberated from the far end of the campground for several minutes, at a regular frequency until eventually it trailed off into the distance. At this point I was assuming it wasn’t someone’s dog, but some wild creature. From what I knew, there is not much big wildlife present in the Patagonia region. Big clumsy camel-like Guanaca, an endangered deer like animal called a Huemel, the Puma, and a healthy selection of birds, rodents, and things of the like. I was unsettled because I knew it couldn’t be something harmless like a guanaco or a deer… they don’t make that noise, right? So… maybe some kind of large bird, roaming around the campground scavenging? Or… Puma? No way. But maybe? Eh well, whatever, it’s gone now and I’ll never know. I drifted off to sleep. ‘RRRAAAAHAHHHHHHHH’ MOTHER OF GOD, jumping out of a slumber to the God-awful sound of whatever hell-spawn creature that thing is, now back, and scoping out the area around my tent. My heart racing, I froze in my half asleep phase, my instinct to just be quiet and not let this flesh eating monster, surely looking for it’s next human meal, know that I am here, and ripe for the picking. ‘RAAAAAHHHHHHHHH’, it called again… only from another direction. Did it move? I heard nothing, no foot steps, no leaves rustling. Are there more than one? WHAT IS IT. I carried a satellite messaging device with me so that I had communication with my wife while I was in the back country. I began messaging her furiously, asking her to get on google and search for what animals roam at night and make a squawking noise. That's the best and most succinct way I could describe the noise. Squawk. Yeah. These satellite devices work slow, and it took awhile to be able to get into a conversation with her about what was going on. Of course she is freaking out now, knowing that I’m out here, about to be murdered by some unknown creature in a foreign country. I end up also messaging my friend TJ, asking him the same thing. While communicating with them, this animal, or animals, or alien, or devil creature is still roaming around the area, making it’s terrifying noise. Neither of them were coming up with anything other than Puma… so of course now I’m thinking I’ve got pumas roaming around… great. I think well maybe I just need to scare it off, and in an attempt to, I grab the corner of the inside of my tent, shake it furiously, and yell, ‘AAHHHHHHHHHH’. Didn’t work. They continued. And would then fall silent. I would lay there, in that silence, hoping they were gone. Minutes would pass, and just when I thought I was free from this torture… ‘RRRAAAAAAHHHHHHHHH’. STILL THERE. I swear they were taunting me. Eventually those pauses in between their calls became permanent, and the creature or creatures that I thought for sure we're going to end my life, were gone. I lay there, eyes wide open, for a good hour after, slowly calming down. Heart beat returning to normal. Sweat drying. Heat dissipating. Fatigue grasping me eventually enough so that I drifted to sleep. I made it. I woke up the next morning intact, and shot this at Laguna Torre, a thin film of ice forming on the surface of the lake from the cold temperatures over night, creating all these great lines in the ice. It was really a great morning, and such a relief after the night that preceded it, which at this point felt like just a nightmare. Did that really happen? Everyone in the campsite was buzzing about it. Everyone was freaked out, no one knew what they were, and many assumed it was Puma.